One does not need to be an avid follower of current affairs to be aware that there are a number of lifestyle-related health issues affecting a large proportion of the UK population. From obesity to type 2 diabetes, the consequences of millions of us eating poorly and not getting sufficient amounts of exercise are, sadly, all too plain to see. We all know that good nutrition is something we should strive towards achieving and maintaining in order to prevent the development of health conditions such as those mentioned above. However, what is perhaps discussed less often are the numerous other benefits of keeping a keen eye on the quality and quantity of our calorie intake. The incredible restorative effects of good nutrition are among the best-kept secrets of the healthcare world. It will not come as a surprise to read that consuming excessive amounts of food rich in sugar and saturated fats can lead to increased body fat, poor levels of energy and other undesirable consequences; did you know, however, that adopting a better nutrition regime has also been proven to help reverse some serious health conditions? After nine weeks of being on the crash diet, one volunteer’s previously serious liver inflammation disappeared, with their liver fat reducing by around 30%. Another participant, a 52-year-old, was told at the start of the experiment that the poor condition of her heart meant she was at the same risk of suffering a heart attack or stroke as a 75-year-old. After nine weeks, this risk was calculated as having dropped to that of a 57-year-old. Their blood pressure had also dropped from the dangerous level of 175/95 to a healthy 114/71 after just four weeks. Perhaps most extraordinarily of all, one participant who was living with type 2 diabetes – something they had always been told was incurable – actually saw his condition go into remission. The medical professionals who monitored the experiment attributed the volunteer’s recovery to the dramatic reduction in liver fat that was brought about by his new nutrition regime; this led to a drop in pancreatic fat, which subsequently altered the body’s levels of insulin production. The programme also revealed that a similar, larger trial was recently conducted with 300 people living with diabetes. Of these, around half of the participants saw their ‘chronic’ condition disappear completely. Unfortunately, the NHS is still reluctant to officially endorse or provide crash, liquid-only diets as a means of fat reduction. This is despite their demonstrable results and related medical benefits, with the healthcare body citing the ‘early’ stage of research - as well as concerns over expense - as its primary reason. We can only hope that this position continues to be reviewed as further studies are undertaken. Another excellent real-life example of the phenomenon of serious medical conditions being reversed by good nutrition comes from the food writer and entrepreneur Ella Mills, who runs the Deliciously Ella recipe website. Although now a highly respected expert in plant-based food, with her own deli, line of healthy snacks and several well-received cookery books to her name, Ella’s journey has not been an easy one, as she explains: “[it] started as a reaction to an illness that I was diagnosed with in 2011, called Postural Tachycardia Syndrome. As you can see, there is much more to be gained from eating sensibly than simply shedding unwanted pounds. You will no doubt be familiar with the phrase ‘you are what you eat’. Whilst this expression is often used to explain the relationship between good nutrition and physical health, it is also true of the effects eating well can have on our state of mind. 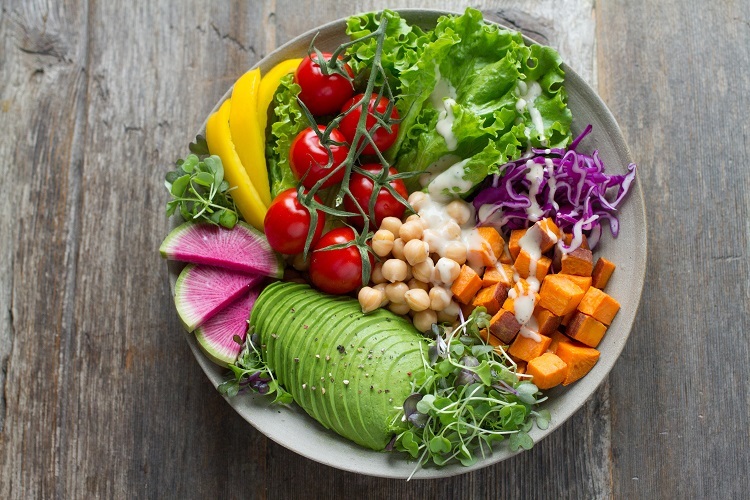 When adhered to in conjunction with a strict exercise regimen (once again, the two disciplines work in harmony and are essential to each other’s success), the consumption of food that is exclusively healthy helps to regulate stress and anxiety, improving our mood and reducing feelings of anxiety and depression. The extent to which nutrition plays an important role in our psychological wellbeing is demonstrated by its inclusion on the website of Mind, the prominent mental health charity. Even if you feel you do not require any support in this area of your life, it is worth reading Mind’s ‘Food and Mood’ page; it offers some interesting information on the link between food and mental health, including sections about getting enough protein and managing caffeine intake. Of course, it cannot be disputed that losing body fat is one of the most common reasons why people become inspired to change their approaches to nutrition for the better. I would urge anyone who is unhappy with their appearance or concerned about the health effects of having too much ‘spare’ fat not to delay and to start eating more wisely as soon as possible – you may be surprised by how quickly it starts paying off. It is worth noting at this point that a reduction in body fat should not be achieved solely through improved nutrition. In order to lose excess body fat healthily, one should also make healthy choices in every other aspect of life, from exercise to sleep. For more information on this, read my blog on the subject, ‘Leading a Healthy Lifestyle’.